Shopping for the perfect pair of ripped jeans can prove to be a very challenging task. From fit and style to the placement of the holes and rips, it can be hard to find a pair that you actually like and look good in. 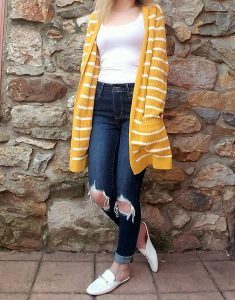 I personally have struggled since 8th grade to find even the right pair of jeans, ripped jeans were on a whole other level. In middle and high school I was very tiny, weighing under 100 pounds and standing under 5”. Jeans just didn’t fit me; the only kind I could wear was the Angel brand jeans from Kohls. Then in college, I could really only wear jeans from American Eagle junior’s jeans. Finding the right pair of denim jeans have always been troublesome for me because of my body type and I know everyone struggles with finding the perfect pair for them as well. My mom always taught me to try on jeans before I bought them and I hated it so much, but now as an adult I totally understand. Every store has a different style, makes them with different materials, and uses different size charts. Apparently, it is impossible to be the same size is every store. I’m usually a 26 in jeans – 2 in women’s or a 3 in juniors. Finding jeans can be a daunting task but I’m here to say that I have finally found a pair of ripped denim that fits me! The pair of Levi’s that I am wearing in the image above is honestly the first pair of ripped jeans that have fit me perfectly, felt comfortable to wear, and made me look good. It’s hard to find jeans that fit all three of those criteria. I had seen other bloggers wearing them online and thought they were so cute, but kind of expensive ($98). I waited until they went on sale, down to $78 to order them. There are many things to contemplate when you are in a store looking for the right jeans to buy. 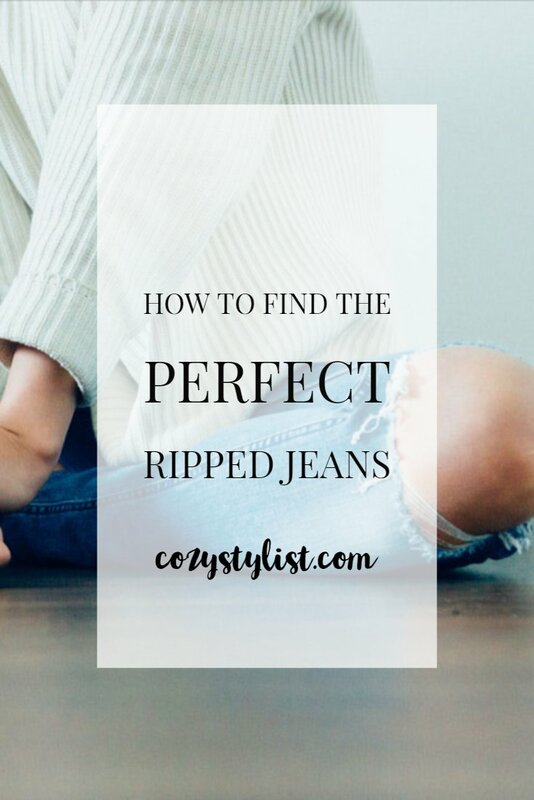 You’ll want to think about how ripped you want the jeans to be, the placement of the rips and holes, what style of jeans are they (skinny, flare, bootcut, cropped) and you need to think about where you would wear these jeans. If you want to just wear them casually on the weekend or out shopping at Target, wear whatever kind of ripped jeans you want. But, if you are wearing these out to dinner or are allowed to wear them to work, you may want the jeans to be more modest with only one or two rips. Also, think about the placement of the holes, do you want to expose your entire thigh or just your kneecaps, do you want them to be totally open holes or have threads running across to cover some skin. As much as we would all wish there was one pair of jeans that would fit all of us (cue Sisterhood of the Traveling Pants) there is not, we all are different heights, weights, and have different body types. If you are short and you can never find jeans that are the same height as you, you need to get familiar with a needle and thread or find yourself a tailor to hem the bottom of the jeans. Also, if you want to appear to look taller, buy a pair of high waisted jeans that will elongate your legs to look just like Carrie Underwood. If you are tall, I suggest wearing flared or cuffed jeans that hit right at your ankle. The cropped look is great if you want to pair the jeans with heels or flats. If all else fails and you have spent your whole life trying to find a pair of ripped jeans that you are convinced don’t exist, it’s time to take matters into your own hands. Distressing your own pair of jeans can be very easy if you have the right tools. Just take the pair of jeans you want to have distressed (maybe practice first on an old pair), get a cheese grater and a pair of scissors. You can look up specific ways to rip them on YouTube or Pinterest for help. Now that you have learned how to find the right pair of ripped jeans for your body type, read my post on how to style running sneakers with them. READ HERE. Ah thank you so much for this post! I am constantly struggling to find the right jeans! so this is a great help. Also, I love your blog design it’s great! I’m so glad that I could help you out! Thanks so much for reading my new post! It is always important to look at where all the rips and holes are in jeans, it could end up being embarrassing! Thanks for reading my post! Oh, the jean struggle! I have to mentally prepare to shop for jeans. There are so many things to consider as you mention. I just buy and pray that they last a long time.